Android Auto allows you to use all of your favorite features from your phone on your in-dash infotainment system. Quite simply, a backup camera is a camera that is installed on the back of a vehicle to allow the driver to see behind the vehicle easily. The 2019 Volvo XC60 is a popular and good-looking SUV. 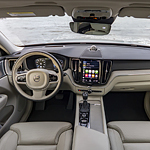 While the 2019 Volvo XC60 provides drivers with plenty of power and interior technology, it also offers occupants a number of safety-boosting features. These safety enhancing features include specialized driver displays, auto dimming interior mirrors, and active bending lighting systems. The 2019 Volvo XC60 provides drivers with the power of a special 360° surround view camera system. This proprietary system gives drivers birds eye views of the terrain around their vehicles. The Volvo XC90 remains a top choice with individuals desiring an SUV with style and sophistication that also performs under a variety of conditions. The latest models enhance your ride via a number of technological features. We have 2019 models available in our inventory for your viewing pleasure. It is no secret that our coastal state has a rich sailing heritage, which is why we at Fathers & Sons Volvo are excited to share this video from Volvo's Ocean Race YouTube channel! What would it take to make the dream of an accident-free world a reality? Volvo is exploring the answer to that question, and has been for the past several decades. When it comes to protecting you and your passengers in an accident, Volvo vehicles have been making a bid for the best automaker in West Springfield, MA for decades. That being said, avoiding the accident altogether is one way to guarantee that you're safe. And that's why our brand is utilizing an innovative suite of accidence avoidance systems to make sure you don't have to worry about impact. When the Volvo brand implemented their Drive-E engine onto an S60 model earlier this year, we were wowed by the model's powerful yet efficient performance. Now, the Swedish automaker is taking things to the next level with their new High Performance Drive-E Powertrain Concept.